Rochelle Goldberg’s sculptural installations incorporate organic and industrial elements — such as chia seeds, crude oil, ceramic, and steel — to suggest poetic, hybrid worlds that radiate with a mysterious psychological narrative. While at the Thun Ceramic Residency in 2016, Goldberg created a series of masks. Each mask utilized the same mold and was hand-filled with clay covered in snakeskin or fingerprint impressions, textures used in her other installation components. 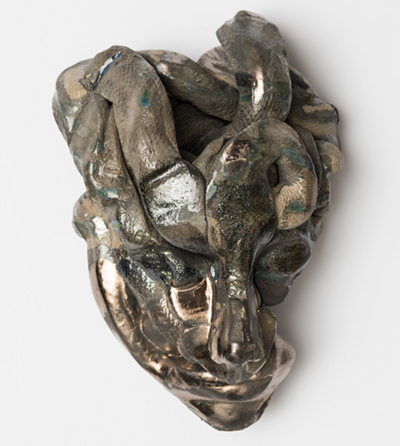 The coil forced into the mask shape suggests the piece represents a shifting, hybrid entity, further emphasized by the snakeskin and reflective glazes that give the work a glistening, slithery quality. Goldberg was the recipient of the 2015 Louis Comfort Tiffany Award, and was the Artist-in-Residence at the Atelier Calder in the spring of 2017. In 2016, she had her first institutional solo exhibition at SculptureCenter in New York, and her work will be on view at The Power Station later this year.